Nearly half a million children living in the United States have elevated blood lead levels that may cause significant damage to their health, estimates the Centers for Disease Control and Prevention (CDC). The estimate is based on children with a blood lead level of 5 micrograms per deciliter or higher using data from national surveys conducted in 2007-2008 and 2009-2010. Major sources of lead exposure to U.S. children include lead-based paint and lead-contaminated dust in deteriorating buildings. Children can also be exposed to lead from additional sources including contaminated drinking water, take-home exposures from a workplace, and lead in soil. 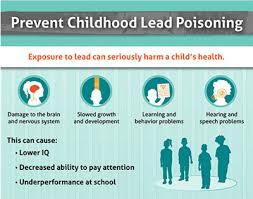 Despite the continued presence of lead in the environment, lead poisoning is entirely preventable. To increase awareness of childhood lead poisoning prevention, the Ulster County Department of Health is participating in National Lead Poisoning Prevention Week (NLPPW) October 23-29. This year's theme, "Lead-Free Kids for a Healthy Future," underscores the importance of testing your home, testing your child, learning about drinking water, and learning how to prevent lead poisoning’s serious health effects. · Learn about lead hazards, how to protect your kids, and foods to feed children that reduce lead absorption. · Go home with a free bag of groceries. · Registration is required. Please call Donna Greenfield @ 845-340-3047 to register. 1. Get Your Home Tested. Before you buy an older home, ask for a lead inspection. 3. Learn About Drinking Water. Water pipes in some older homes may contain lead solder where lead may leach out into the water. 4. Understand the Facts! Go to http://ulstercountyny.gov/health/environmental-health-services-division and click on “Childhood Lead Poisoning Prevention Program” for more information, or call 845-340-3047.